Are you stuck in a rut? Do you want to discover your true potential? Discover how our experienced Life Coach can help you live to your full potential! Perhaps you lack direction, feel overwhelmed or out of control? Are you frustrated by your constant procrastinating? Perhaps you lack the confidence, the clarity, or the motivation to take the next step? We have developed unique and highly successful life coaching programs which make use of the latest solution-focused mind techniques that will help you achieve your goals in a fraction of the time, whilst uncovering a whole new level of self awareness! 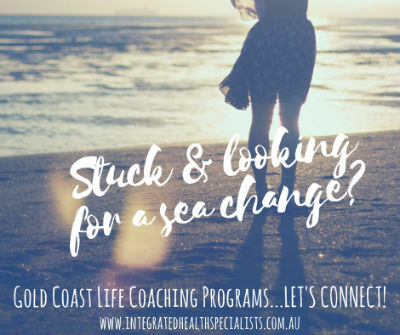 Our experienced Life Coach, Psychologist and Hypnotherapist will help you clarify your direction, whilst removing the limitations that are holding you back, and significantly improve the quality of your life by helping you to get off that treadmill and get real about the kind of life you want! The major keys to your success in achieving more in life, starts with identifying exactly what you want in your life, identifying and removing the limitations that are holding you back, and then developing and implementing a realistic action plan to get there. This is how a life coach can help you to live a more fulifilling and meaningful life! STEP 2 – Identify and remove any limitations that act as barriers on the road you are travelling on, and hold you back from achieving your dreams. Perhaps part of your life vision is to build financial wealth but you have a belief that money is the root of all evil! Then there would be a huge conflict before you begin, as part of you wants to build financial wealth and part of you doesn’t! This conflict would absolutely hold you back so it needs to be removed by working with both your conscious and subconscious mind. You may think your beliefs are real, but in fact it is your limited beliefs that are actually preveting you from achieving your goals. STEP 3 – With your destination identified and the road now clear of those roadblocks, it’s time to develop your road map to get you to your destination. You’ll develop goals and an action plan to achieve what you truly desire. Then we support you and hold you accountable to get those tasks done, and deal with any hiccups along the way. Identify exactly where you are now and where you want to be, helping you to understand what you really want, discover your true passions, purpose and your dreams. Identify the limitations that are holding you back; your underlying beliefs and psychological patterns that are preventing you from achieving what you want. Firstly work with your conscious mind to expand your awareness of your current thoughts, belief systems, emotional state, and behavioural patterns at a conscious level, and we will change your current disempowering beliefs and false perceptions that are holding you back. Then work directly with your subconscious mind, as internal conflict occurs when your conscious and your subconscious minds are not working together. Imagine your brain as a ship where your conscious mind is the captain and your subconscious mind represents the crew. The captain may wish to direct the ship in a certain direction, but if the crew aren’t working with the captain…well there’s mutiny! So we work directly with your subconscious mind to align it with your conscious mind by using proven techniques like Hypnotherapy, Neuro Linguistic Programming (NLP) and Emotional Freedom Techniques (EFT). Finally, with a clear vision and destination, and with your old roadblocks out of the way, we’ll then develop practical goals and an action plan to achieve your true desires in life. We will then hold you accountable in getting those steps done in your action plan to live the kind of life that you truly want and deserve! By the end of your 14 week life coaching program you will have the clarity, the confidence, and the plan to move forward in life and to start living the life you truly desire!